Merino young ewes, Woodpark-blood, made to a solid $224 a head at the Rodwells/Landmark spring store sheep sale held at Wycheproof on Thursday. 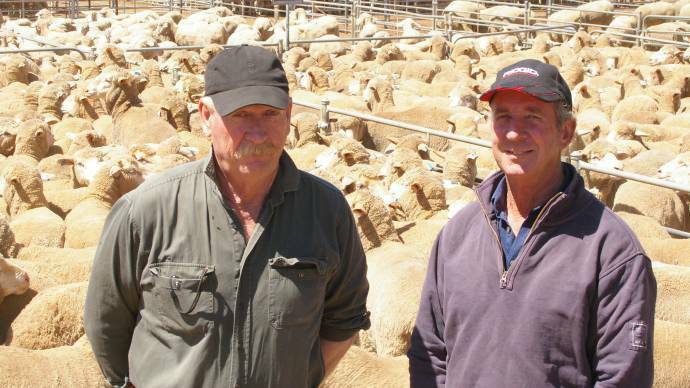 Being the third sale in the spring series for the Wimmera/Mallee saleyards, the market toppers were a line of 398 offered by JH Evans & Sons, Fernihurst Estate that were sold to Corcoran Parker, Corowa for the Everitt family of Brocklesby, NSW. Other sales for smaller framed Merino young ewes made $150-$175 while two year-old ewes, Lewisdale-blood, made $180, and Panarama-blood four year-olds, $164. Other yards of 4-5 year-old Merino ewes made $140-$162 while a small selection of crossbred young ewes made $225-$245, and five year-olds $146-$160. Image: courtesy Stock & Land. JH Evans & Sons partners Dallas and Barry Evans, with their Fernihurst Estate Woodpark-blood young ewes sold at $224 a head.